Malaysia Specialty Coffee Association (MSCA) is conducting a brief survey for Preliminary Round of National Championships 2020. This survey is to gather the opinions and feedback from competitors/ judges on the new proposed cities for our Preliminary Round. The survey is short and will only take 3 minutes to complete. Kindly click HERE for the e-survey, the link will be closed on 19 April 2019. Your participation in this survey will help us to understand better and provide an even better experience for future plans. NATIONAL CHAMPIONSHIPS 2019 HAPPENING NEXT MONTH! 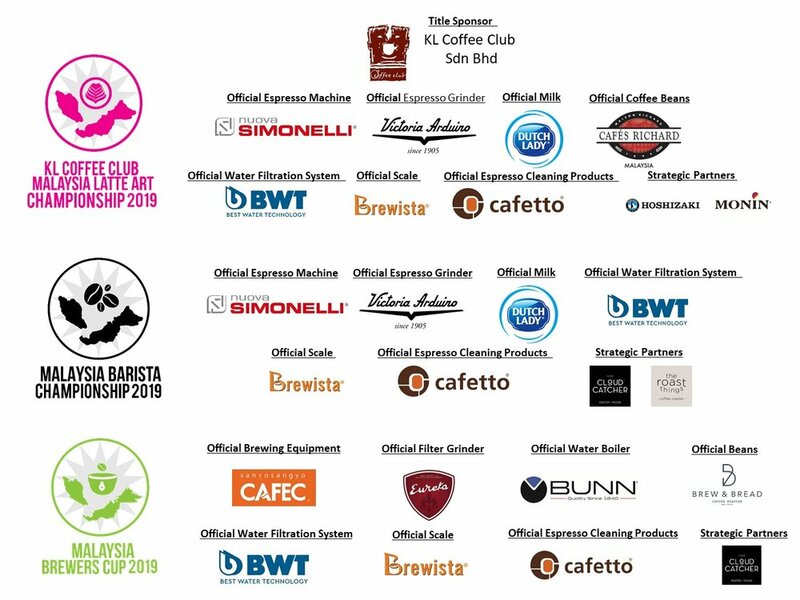 Malaysia Specialty Coffee Association is pleased to announce that National Championships 2019 which are sanctioned by World Coffee Event (WCE) are back in 2 weeks time! After achieving amazing results on the World Stage 2018, our competitors have been sharpening their skills and working hard, this year’s competition is definitely one not to be missed! We would also like to extend our appreciation and gratitude to all of our competition sponsors! Here is our competitions schedule so do clear out your schedules and show your support for all our competitors! VOLUNTEER NEEDED FOR SEMI-FINAL & FINAL ROUND! As a token of appreciation, we will be providing meals and certificate. Your support means a lot to us. Kindly fill up the volunteer registration form HERE! Malaysia Specialty Coffee Association (MSCA) is pleased to announce Judges Registration for 3 competitions are now OFFICIALLY CLOSED. We will no longer accept further registration. They were selected are going through a pre-competition heats rounds that follows competition standards as closely as possible and judges by a qualified calibrated panel of judges. MLAC & MBrC 2019 PRELIMINARY RESULTS! Here are your respective competition Top 12! ANNOUNCEMENT: PRELIMINARIES ROUND VENUE CHANGED! M6, ML16 Industrial Park, Seri kembangan, 43200, Selangor. We would like to apologize for the short notice. MLAC & MBRC PRELIMINARIES ARE HAPPENING NEXT MONTH! 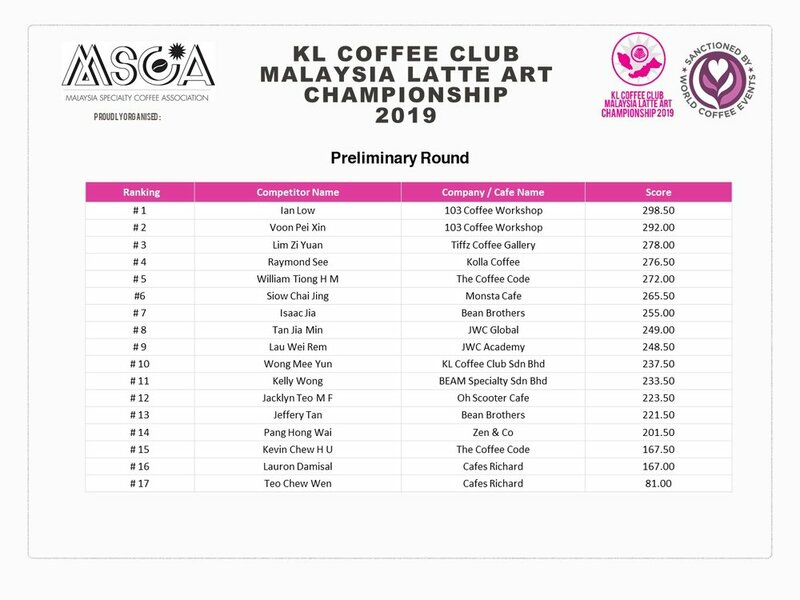 Malaysia Specialty Coffee Association (MSCA) is pleased to announce that preliminaries of 2019 KL Coffee Club Malaysia Latte Art Championship (MLAC) & 2019 Malaysia Brewers Cup (MBrC) will be happening next month. The format of the preliminaries will follow closely to the world competition standards and only the Top 12 competitors for respective championships will be selected to compete in January 2019. Please view the preliminary schedule HERE! Give them all the moral support you can! VOLUNTEER NEEDED FOR PRELIMINARY ROUND! As a token of appreciation, we will provide meal and certificate. Your support means a lot to us. Malaysia Specialty Coffee Association is pleased to announce that the available sponsorship packages are now open for bidding. For more information, please download the Sponsorship Deck HERE! Malaysia Specialty Coffee Association (MSCA) is pleased to announce Judges registration for 3 competitions are now OFFICIALLY OPEN. ANNOUNCEMENT FOR COMPETITOR REGISTRATION OF NATIONAL CHAMPIONSHIPS 2019 ARE OFFICIALLY CLOSED! Malaysia Specialty Coffee Association (MSCA) is pleased to announce Competitors Registration for 3 competitions are now OFFICIALLY CLOSED. We will no longer accept further registration. Malaysia Specialty Coffee Association (MSCA) is pleased to announce competitor registration for 3 competitions are now OFFICIALLY OPEN. Malaysia Specialty Coffee Association (MSCA) is pleased to announce the sponsorship bidding for the following championships is now OFFICIALLY OPEN. MSCA IS RECRUITING NEW MEMBERS. JOIN US NOW! Malaysia Specialty Coffee Association (MSCA) is now recruiting new members. Members of the MSCA will enjoy benefits of first-hand updates on the upcoming Coffee Events in Malaysia. Members will also enjoy privileges that include rebates for courses, seminars and conferences that will be organized by the association. Definition: Ordinary membership is open to corporation, firm or business related to the coffee industry whose entity resides or has business dealings within Malaysia. Definition: Any international organisations, companies, firms or associations incorporated or registered outside Malaysia, who are interested in coffee industry. Malaysia Specialty Coffee Association (MSCA) is proud to be a supporting partner of Invest Selangor on the 2nd edition Selangor International Business Summit 2018 which will be happening in September. Please mark your Calendar now!